When last we left our heroes (Adventures of Superman #7), Lex Luthor had informed Lois Lane that she was going to help him win the most powerful office on Earth - the Presidency. Meanwhile, Superman was on Planet X* in the mist of flying nukes. Whatever will our heroes do? Adventures of Superman #8 continues to tell two parallel stories. Both stories are about fighting evil. 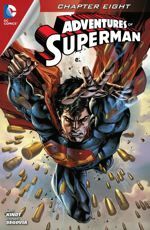 Superman fights the physical threats that face the universe while the very human Lois Lane fights on a more cerebral plane. One fight (Superman's) is direct and... one might say... "black and white." However, Lois' confrontation with Lex, while subtle and more controlled, is, in many ways, more deadly and menacing. Despite the danger, Lois laughs in Lex's face. Who in the world would help Lex Luthor become President? She knows his history. Anyone who stands up to Lex is usually put down. He has screwed over too many people. Those in Metropolis who have any kind of authority or office know Lex's true nature. He shows the world a humble, caring mask. But underneath the suave veneer Lex is a snake ready to strike at anything or anyone he perceives as a threat to his power. Thus, he needs Lois Lane. She is trusted - not only by the people of Metropolis, but by people all over the world. If Lois Lane reports something, people believe it to be factual and true. Lex knows that getting Lois Lane on his side will help him win the White House. Meanwhile, on Planet X Superman has easily disabled all the nukes; thus forestalling them from destroying the planet. Now comes the hard part... finding out why the alien races on Planet X were fighting in the first place. He makes a quick trip to the planet's library and after a speed-read of the planet's records, Superman discovers what he has discovered on every other planet he has saved - land and resources are what these peoples are vying over. To resolve the problem Supes turns himself into a Kryptonian rock-drill. He tunnels his way through the planet's crust to find 'the crystal' that will provide an almost limitless source of energy for Planet X. How did he know where to find the crystal? How did he know it would work? Well, he's done the same for three other planets this year. So, Superman hands over the crystal to Planet X's leaders, then he's off to the next crisis. And of course a Boom Tube equals Apokolips. Back on Earth, Lois is continuing to expound on Luthor's many faults... right to his face. In return, Lex tells Lois that if she doesn't use her reporting skills to get him into the White House, she will loose everyone she loves within the next hour. Story - 4: The Good: I love this story. The tale is, at its essence, is all that a Superman story should be. Superman is the Boy Scout who uses his powers to help everyone he can. He doesn't stick around for accolades or thanks. He takes care of business and then is on to the next crisis. At the same time, he's obviously on a mission to get somewhere at a certain time. He has a 'normal' life he has to get to. He plans his day, but he understands that those plans may not turn out as he thinks or wants. He is confident, precise and brave in the face of foes that match him in strength and intelligence. I also love the parallel story with Lois and Lex. Lois in her own right is a hero. She fights evil in her own way. She is fearless and relentless in her pursuit of truth and justice. Lois uses truth to take down those who would do others harm. She knows how dangerous Lex is; however she faces him as an equal. She reminds him that finding out the truth about him AND reporting it to the world is her job. She refuses to be afraid of Lex. Does Superman have her back? Yes. Does she remind Lex of this? Yes. But she would be fearless with or without Superman. Art - 4: Both Superman and Lois are beautifully drawn. Lex's features are a little off. He smirks in all the right places, but he isn't very intimidating. Apokolips and Planet X are drawn and colored well. However there is nothing extraordinary. It's not boring, just forgettable. Superman and Lois' internal dialog carry most of the story. All in all, a great story. I can't wait for the next part. *the comic doesn't give the planet's name.